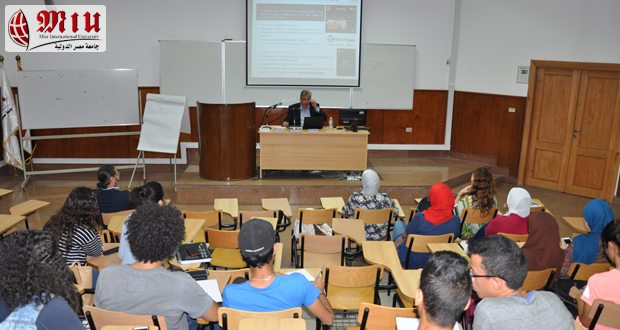 As a part of its interest to continuously update the students with the recent developments in the field of business, the Management Department,Faculty of Business Administration and International Trade, held on 14th May, 2018 a seminar on a growing business interest in Egypt and worldwide, which is the Corporate Social Responsibility (CSR). 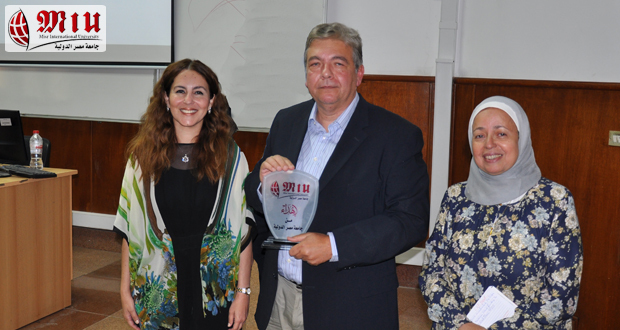 The guest speaker of this seminar was Mr. Sherif Eissa, Head of Environmental Sustainability and Legal Regulatory Affairs at ORANGE Egypt. Mr. Eissa dedicated a considerable part of his presentation to explaining the concept of the CSR, stating that it simply means “broadening the scope of company commitments by taking account of the social, economic and environmental interests of the society”. The framework of that concept was outlined by some international protocols and documents like the UN Global Compact (the largest international CSR agreement in the world), the Global Reporting Initiative and the ISO 26000. As application of the CSR, Mr. Eissa browsed the various CSR activities of Orange Group Corporation which include organizing competitions for innovative entrepreneurship projects and innovations to use technology in serving society. They also include Enactus National competition, women empowerment, partnering with national and international NGOs and focus groups in many fields like fighting common ailments as diabetes and cancer, supporting better nutrition, online protection and safe usage of Internet and Autism. Orange Group Corporation also allocates a considerable interest to the environmental issues focusing on some areas like environmental awareness, climate change and responsible consumption. Those activities have covered serious topics like the radio waves, and tried to encourage projects in renewable and clean energy. 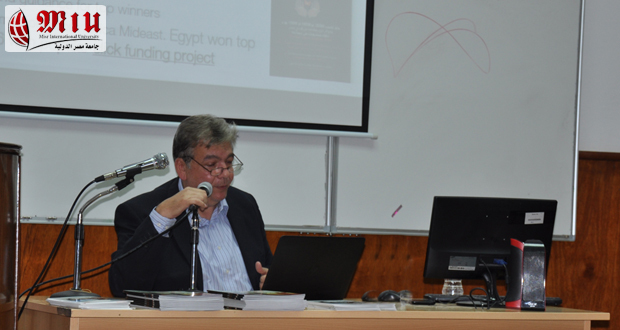 After the presentation, the attendees raised some questions regarding the percentage of the Corporation profits dedicated to CSR activities, claiming it is still very modest in Egypt. 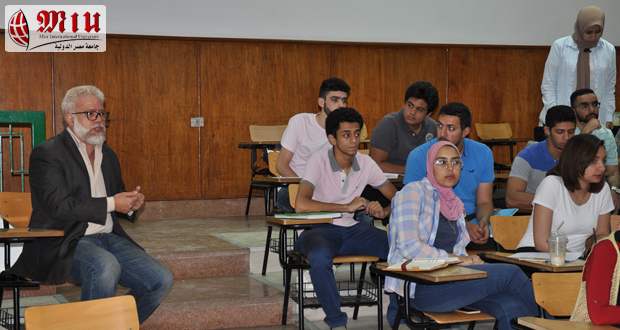 Other attendees raised questions about the existence of independent entities in Egypt to inspect and asses the CSR activities. They also questioned the amount of the big communication companies’ expenditure on TV campaigns. 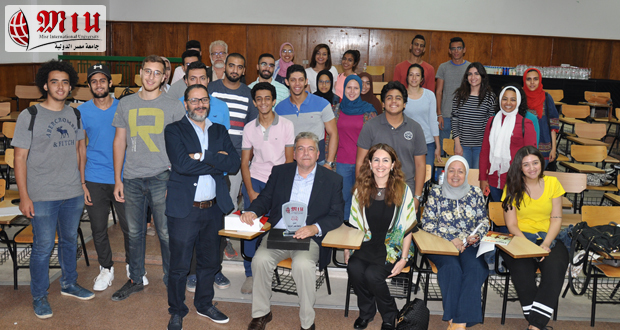 At the end, the students and other audience showed their appreciation to Mr. Eissa for his outstanding presentation and for sharing his valuable experience.